Mental disorders, including depression, bipolar disorder, schizophrenia and anxiety disorders represent some of the most serious and intractable of all diseases. They cause untold suffering and a massive economic burden on the society. It is estimated that one in every four American adults suffer from a mental disorder in any given year, and depression is among the leading causes of disability worldwide. Unfortunately, psychiatric disorders are also among the most mysterious of all diseases. Their underlying causes are still poorly understood, and their diagnosis is still based purely on behavioural criteria. Voxel-based morphometric (VBM) was defined as 'a voxel-wise' comparison of the local concentration of grey matter (GM) between two groups of patients. Functional magnetic resonance imaging (fMRI) is a relatively new procedure that uses MRI to measure the tiny metabolic changes that take place in an active part of the brain. Diffusion tensor imaging (DTI) is an MRI-based neuroimaging technique which makes it possible to estimate the location, orientation and anisotropy of the brain's white matter (WM) tracts. Fractional anisotropy (FA) is used in DTI, and it is a scalar value between zero and one that describes the degree of anisotropy of a diffusion process. A value of zero means that diffusion is isotropic, i.e., it is unrestricted (or equally restricted) in all directions. A value of one means that diffusion occurs only along one axis and is fully restricted along all other directions. FA is a measure often used in diffusion imaging where it is thought to reflect fibre density, axonal diameter and myelination in WM. The FA is an extension of the concept of eccentricity of conic sections in three dimensions, normalised to the unit range. Fibre tracking uses the diffusion tensor to track fibres along their whole length. Magnetic resonance spectroscopy (MRS) is a specialised technique associated with MRI [Graph 1] and [Graph 2]. MRS, also known as nuclear magnetic resonance spectroscopy, it is a non-invasive and ionising-radiation-free analytical technique that has been used to study metabolic changes in brain tumours, strokes, seizure disorders, Alzheimer's disease, depression and other diseases affecting the brain. It has also been used to study the metabolism of other organs such as muscles. Schizophrenia is a serious genetic illness with a lifetime incidence of 1% in the general population during adolescence and early adulthood. It is characterised by a diversity of complex symptoms that range from positive symptoms such as delusions and auditory hallucinations to negative symptoms such as apathy, anhedonia, blunted affect, poverty of speech and broad cognitive deficits in domains such as attention, memory and language. VBM changes, most consistently in the left superior temporal gyrus and left medial temporal lobe. An increased ventricle-to-caudate ratio computed using VBM analysis was suggested as a possible early biomarker of schizophrenia. Brain volumes were reduced by 2.7% in the first-schizophrenic- episode medication-naïve patients compared to the brain volumes of healthy control patients. Patients with recurrent episodes of illness show extended alterations in the mentioned brain areas in addition to bilateral GM loss in the prefrontal cortex, hippocampus, amygdala and basal ganglia, suggesting that brain abnormalities are not static but progress over time [Figure 1]. Alterations of task-induced brain activation in fMRI have been described in schizophrenia. Two core findings across studies are a decrease of frontal activations, referred to as hypofrontality, and increased activation of midline structures such as the anterior cingulate cortex (ACC), interpreted as resting-state activations that persist inappropriately into task conditions. It also shows decreased connectivity between the bilateral auditory cortex regions in patients with auditory hallucinations [Figure 2]. Autism spectrum disorder (ASD) is relatively common neurodevelopmental disorders, affecting approximately 1/150 children. ASDs are characterised by three core symptoms, namely, impaired social reciprocity, communication difficulties and repetitive stereotyped behaviours. Motor function, attention and other cognitive domains may also be affected. ASD is known to display early alterations in WM development. Over proportional brain growth  accompanied by mainly frontally increased FA values in young children  is followed by WM  and GM  volume reduction and FA value decrease in older children, adolescents and adults with ASD compared to healthy controls [Figure 3]. 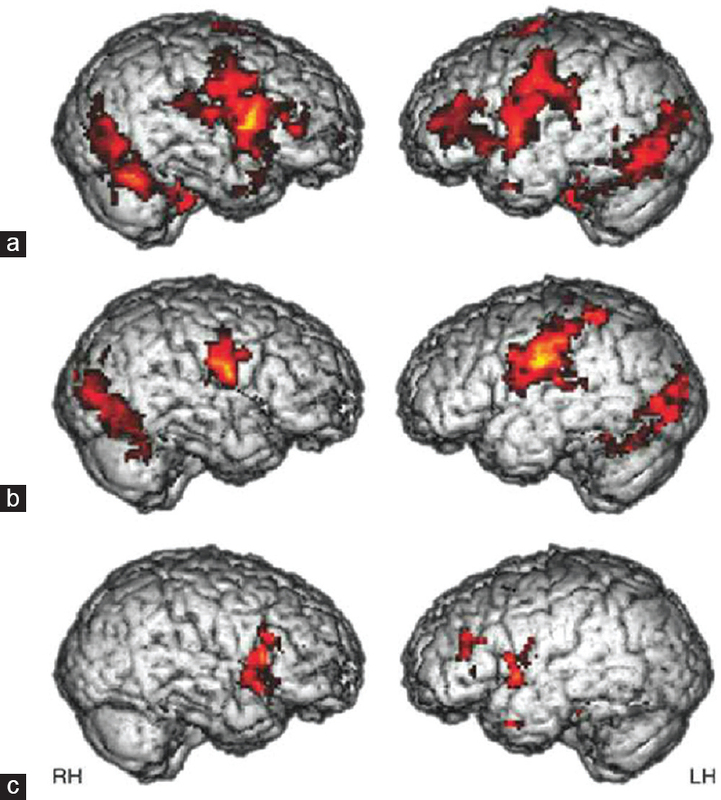 fMRI studies showed alterations in memory, recognition of face expression, selective attention, cognitive control and executive function, self- and-other reflection, self-representation, and motor response inhibition in patients with ASD [Figure 4]. Mood disorders can be classified as primary (functional) or secondary (i.e., presumed to be directly caused by a cerebral or other physical disorder). Bipolar disorder is a clinically heterogeneous disorder characterised by alternating periods of depression and mania interspersed with periods of euthymia. The structural brain abnormalities reported in the MRI studies were increased volumes of the lateral ventricles (17% increases) and the third ventricle, a decreased cross-sectional area of the corpus callosum and increased high-signal intensity regions in the WM. The high-signal intensity in cortical (frequently in the frontal lobes) and subcortical regions, but not periventricular WM regions, is most consistently reported in association with bipolar disorder. However, high-signal intensity WM regions are non-specific and reflect cerebrovascular damage, astrocytic gliosis, dilated perivascular spaces and demyelination. The subgenual ACC volume is reduced by 39% in bipolar depressed patients. Lithium, a mainstay drug for acute mania, augments the GM volume in patients with bipolar disorder. Reduced N-acetylaspartate and abnormal choline, myo-inositol and Glx levels, accompanied by altered phospholipid metabolism (at 31P MR spectroscopy) point strongly towards a shift from oxidative phosphorylation to glycolysis due to the mitochondrial dysfunction with bipolar disorder. The main subtype of unipolar mood disorder is a major depressive disorder. The major depressive disorder is characterised by one or more episodes of anhedonia, a sense of guilt, impaired concentration, fatigue, loss of sleep and suicidal thoughts. Most of the MR findings overlap between those of major depression and bipolar disease because these two conditions share common depressive episodes. Many researchers tend to study mood disorders and affective illnesses, which include major depression and bipolar disease. However, this leads to overlapping findings and some difficulty interpreting them. The prefrontal cortex and the anterior limbic structures are key players in the altered emotional processing and cognitive disturbances in major depression, as in bipolar disorder. The majority of volumetric MR studies have revealed GM loss and volume reductions in subregions of the prefrontal cortex, medial temporal lobe, amygdala and hippocampus across all age ranges [Figure 5]. Abnormal Glx concentrations and γ-aminobutyric acid peaks have been found in several proton MR spectroscopic studies. In a meta-analysis of proton MR spectroscopic studies of major depressive disorder, decreased rather than increased (as in bipolar disorder) glutamate levels were found in depressed individuals. Attention-deficit hyperactivity disorder is defined on the basis of developmentally inappropriate symptoms such as lack of attention, motor restlessness and impulsivity. The most frequent alteration seen in children with attention-deficit hyperactivity disorder is a 3%–4% of the reduction in total cerebral and cerebellar volumes. There is also a substantial decrease in the WM of non-medicated children, that is, inversely related to age and suggesting early damage. The frontostriatal circuitry is Key in understanding the pathogenesis of this disorder. These systems regulate attention shifting, planning, executive function, working memory, response inhibition and reward motivation. Cortical thinning in the medial prefrontal cortex was found to be a predictor of poorer clinical outcome at 5 years. Dorsal ACC volume is reduced in both adults and children with attention-deficit hyperactivity disorder. Aberrant anatomic connectivity has been detected in not only the frontostriatal regions but also the parietal and occipital regions in these patients. Many of these regions are connected to the cerebellum. Reduced FA in the prefrontal-striatal fibre tracts of both children with attention-deficit hyperactivity disorder and their parents correlated positively with the go/no-go task (attention), revealing the heritability of aberrant frontostriatal systems. A dysfunctional basal ganglia and hypoactivation of the frontostriatal systems substantiate the reported structural abnormalities in the same regions. fMRI studies had revealed hypoactivation of the cerebellum and only a trend towards hypoactivation of the prefrontal cortex when the working memory of children and adults with Attention-deficit hyperactivity disorder was tested [Figure 6]. An increased choline/Cr ratio in the ACC in medication-naïve adults with attention-deficit hyperactivity disorder and in the basal ganglia of medication-naïve children with attention-deficit hyperactivity disorder suggests subtle structural membrane alterations. A study done by Dr. Margaretha Dramsdahl stated that the main finding of a reduced ratio of Glu/Cre in the left midfrontal region in participants with attention-deficit hyperactivity disorder (ADHD) supports the hypothesis of ADHD as a hypoglutamatergic condition. Glutamate is an important neurotransmitter in cognitive processes  and seems to have a central role in neurotransmission. The dorsal ACC, in turn, plays a crucial role in the exertion of cognitive, and a glutamatergic deficit in the midfrontal region including the dorsal ACC may contribute to the impaired cognitive control in persons with ADHD [Figure 7]. 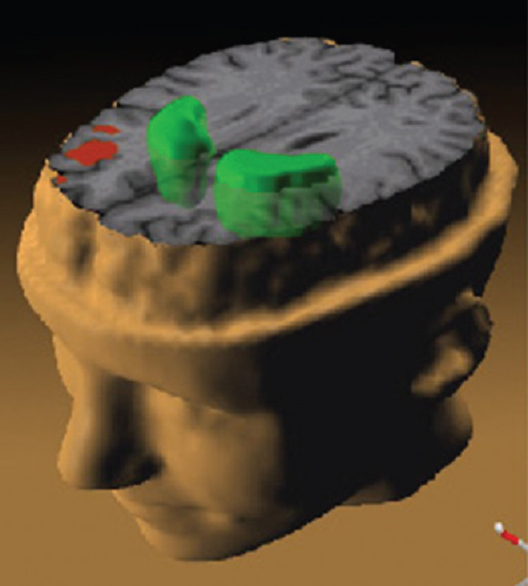 Figure 7: The position of the 20-mm × 20-mm × 20-mm voxel in the midfrontal region. Even though, that specific diagnostic tool not established, MR researches in psychiatry are playing a fundamental role in removing the societal stigma of psychiatric illness by helping to document objective structural and functional differences in the brains of psychiatric patients. It discloses the mystery of the psychiatric diseases and helps in understanding the structural and functional changes happen with it. Currently, there are many limitations facing the newly emerging psychoradiology field to be established as a diagnostic filed, mainly due to variation in brain activity among people with the same diagnosis; moreover, the psychiatric conditions can look quite different in different individuals, also the overlap between different diseases, as the different psychiatric conditions often share similar symptoms and imaging findings. Finally, similar brain areas are involved in different psychiatric conditions. We hope and expect in the future that systematic approach using multimodal neuroimaging and a variety of analysis methods would have the potential to identify reliable biomarkers for specific psychiatric disorders. With on-going progress being made in neuroimaging methods, neuroimaging holds clear promise in helping to diagnose and quantify psychiatric diseases. Mcgovern Mit Institute. Available from: http://www.mcgovern.mit.edu/brain-disorders/psychiatric. [Last accessed on 2017 Aug 06]. Ashburner J, Friston KJ. Voxel-based morphometry – The methods. Neuroimage 2000;11:805-21. Available from: https://www.radiologyinfo.org/en/info.cfm?pg=fmribrain. [Last accessed on 2017 Aug 06]. Available from: http://www.imagilys.com/diffusion-tensor-imaging-dti/. [Last accessed on 2017 Aug 06]. Available from: https://www.en.wikipedia.org/wiki/Fractional_anisotropy. [Last accessed on 2017 Aug 06]. Rudin M, editor. 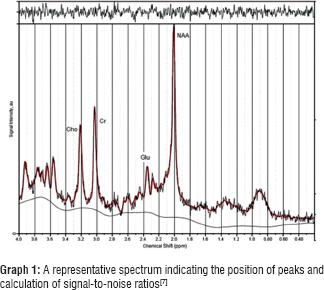 In Vivo Magnetic Resonance Spectroscopy. Berlin: Springer-Verlag; 1992. Dramsdahl M, Ersland L, Plessen KJ, Haavik J, Hugdahl K, Specht K, et al. Adults with attention-deficit/hyperactivity disorder – A brain magnetic resonance spectroscopy study. Front Psychiatry 2011;2:65. Available from: https://www.en.wikipedia.org/wiki/In_vivo_magnetic_resonance_spectroscopy#cite_note-isbn3-540-55029-1-1. [Last accessed on 2017 Aug 06]. Lewis DA, Lieberman JA. Catching up on schizophrenia: Natural history and neurobiology. Neuron 2000;28:325-34. Agarwal N, Port JD, Bazzocchi M, Renshaw PF. Update on the use of MR for assessment and diagnosis of psychiatric diseases. Radiology 2010;255:23-41. Honea R, Crow TJ, Passingham D, Mackay CE. Regional deficits in brain volume in schizophrenia: A meta-analysis of voxel-based morphometry studies. Am J Psychiatry 2005;162:2233-45. Chua SE, Cheung C, Cheung V, Tsang JT, Chen EY, Wong JC, et al. Cerebral grey, white matter and csf in never-medicated, first-episode schizophrenia. Schizophr Res 2007;89:12-21. Steen RG, Mull C, McClure R, Hamer RM, Lieberman JA. Brain volume in first-episode schizophrenia: Systematic review and meta-analysis of magnetic resonance imaging studies. Br J Psychiatry 2006;188:510-8. Meisenzahl EM, Koutsouleris N, Bottlender R, Scheuerecker J, Jäger M, Teipel SJ, et al. Structural brain alterations at different stages of schizophrenia: A voxel-based morphometric study. Schizophr Res 2008;104:44-60. Pomarol-Clotet E, Salvador R, Sarró S, Gomar J, Vila F, Martínez A, et al. Failure to deactivate in the prefrontal cortex in schizophrenia: Dysfunction of the default mode network? Psychol Med 2008;38:1185-93. Gavrilescu M, Rossell S, Stuart GW, Shea TL, Innes-Brown H, Henshall K, et al. Reduced connectivity of the auditory cortex in patients with auditory hallucinations: A resting state functional magnetic resonance imaging study. Psychol Med 2010;40:1149-58. Rapin I, Tuchman RF. What is new in autism? Curr Opin Neurol 2008;21:143-9. Courchesne E, Redcay E, Kennedy DP. The autistic brain: Birth through adulthood. Curr Opin Neurol 2004;17:489-96. Ben Bashat D, Kronfeld-Duenias V, Zachor DA, Ekstein PM, Hendler T, Tarrasch R, et al. Accelerated maturation of white matter in young children with autism: A high b value DWI study. Neuroimage 2007;37:40-7. Toal F, Daly EM, Page L, Deeley Q, Hallahan B, Bloemen O, et al. Clinical and anatomical heterogeneity in autistic spectrum disorder: A structural MRI study. Psychol Med 2010;40:1171-81. McAlonan GM, Suckling J, Wong N, Cheung V, Lienenkaemper N, Cheung C, et al. Distinct patterns of grey matter abnormality in high-functioning autism and Asperger's syndrome. J Child Psychol Psychiatry 2008;49:1287-95. Thakkar KN, Polli FE, Joseph RM, Tuch DS, Hadjikhani N, Barton JJ, et al. Response monitoring, repetitive behaviour and anterior cingulate abnormalities in autism spectrum disorders (ASD). Brain 2008;131:2464-78. Noonan SK, Haist F, Müller RA. Aberrant functional connectivity in autism: Evidence from low-frequency BOLD signal fluctuations. Brain Res 2009;1262:48-63. Welchew DE, Ashwin C, Berkouk K, Salvador R, Suckling J, Baron-Cohen S, et al. Functional disconnectivity of the medial temporal lobe in Asperger's syndrome. Biol Psychiatry 2005;57:991-8. Belmonte MK, Yurgelun-Todd DA. Functional anatomy of impaired selective attention and compensatory processing in autism. Brain Res Cogn Brain Res 2003;17:651-64. Kennedy DP, Courchesne E. Functional abnormalities of the default network during self- and other-reflection in autism. Soc Cogn Affect Neurosci 2008;3:177-90. Mueller S, Keeser D, Reiser MF, Teipel S, Meindl T. Functional and structural MR imaging in neuropsychiatric disorders, part 2: Application in schizophrenia and autism. AJNR Am J Neuroradiol 2012;33:2033-7. World Health Organization. The World Health Report 2001: Mental Health – New Understanding, New Hope. Geneva, Switzerland: World Health Organization; 2001. Sarró S, Pomarol-Clotet E, Canales-Rodríguez EJ, Salvador R, Gomar JJ, Ortiz-Gil J, et al. Structural brain changes associated with tardive dyskinesia in schizophrenia. Br J Psychiatry 2013;203:51-7. Available from: http://www.en.citizendium.org/wiki/File: Schizophrenia_glutamate.jpg#Licensing. [Last accessed on 2017 Aug 07]. Itahashi T, Yamada T, Nakamura M, Watanabe H, Yamagata B, Jimbo D, et al. Linked alterations in gray and white matter morphology in adults with high-functioning autism spectrum disorder: A multimodal brain imaging study. Neuroimage Clin 2015;7:155-69. Samardzic L, Nikolić G. Neurobiology of psychotherpeutic relationship - new perspectives. Sci J Fac Med Niš 2013;30:55-61. Lyoo IK, Lee HK, Jung JH, Noam GG, Renshaw PF. White matter hyperintensities on magnetic resonance imaging of the brain in children with psychiatric disorders. Compr Psychiatry 2002;43:361-8. Kirkpatrick JB, Hayman LA. White-matter lesions in MR imaging of clinically healthy brains of elderly subjects: Possible pathologic basis. Radiology 1987;162:509-11. Bearden CE, Thompson PM, Dalwani M, Hayashi KM, Lee AD, Nicoletti M, et al. Greater cortical gray matter density in lithium-treated patients with bipolar disorder. Biol Psychiatry 2007;62:7-16. Stork C, Renshaw PF. Mitochondrial dysfunction in bipolar disorder: Evidence from magnetic resonance spectroscopy research. Mol Psychiatry 2005;10:900-19. Drevets WC, Price JL, Simpson JR Jr., Todd RD, Reich T, Vannier M, et al. Subgenual prefrontal cortex abnormalities in mood disorders. Nature 1997;386:824-7. Beyer JL, Krishnan KR. Volumetric brain imaging findings in mood disorders. Bipolar Disord 2002;4:89-104. Kong L, Wu F, Tang Y, Ren L, Kong D, Liu Y, et al. Frontal-subcortical volumetric deficits in single episode, medication-naïve depressed patients and the effects of 8 weeks fluoxetine treatment: A VBM-DARTEL study. PLoS One 2014;9:e79055. Yildiz-Yesiloglu A, Ankerst DP. Review of 1H magnetic resonance spectroscopy findings in major depressive disorder: A meta-analysis. Psychiatry Res 2006;147:1-25. Castellanos FX, Giedd JN, Marsh WL, Hamburger SD, Vaituzis AC, Dickstein DP, et al. 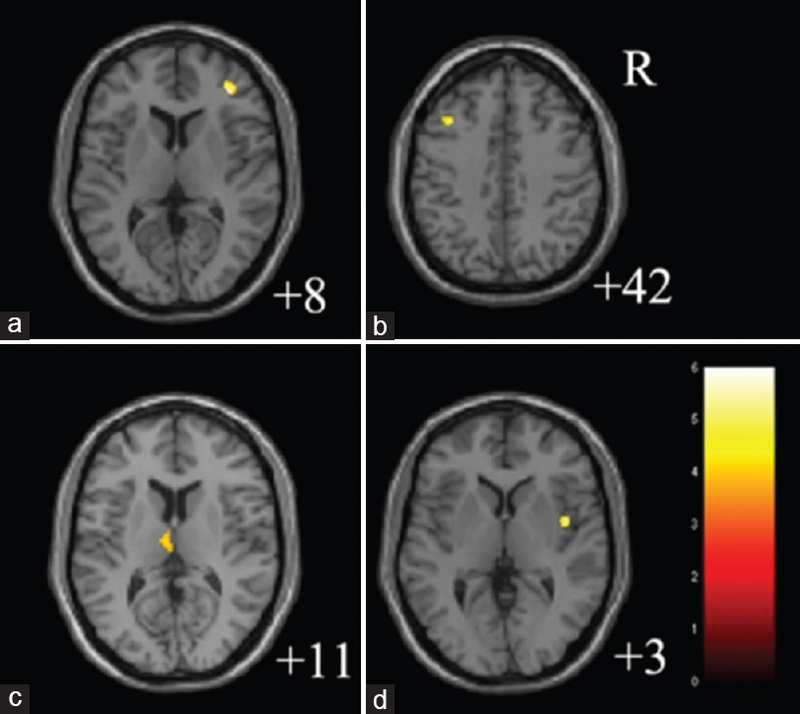 Quantitative brain magnetic resonance imaging in attention-deficit hyperactivity disorder. Arch Gen Psychiatry 1996;53:607-16. Valera EM, Faraone SV, Murray KE, Seidman LJ. 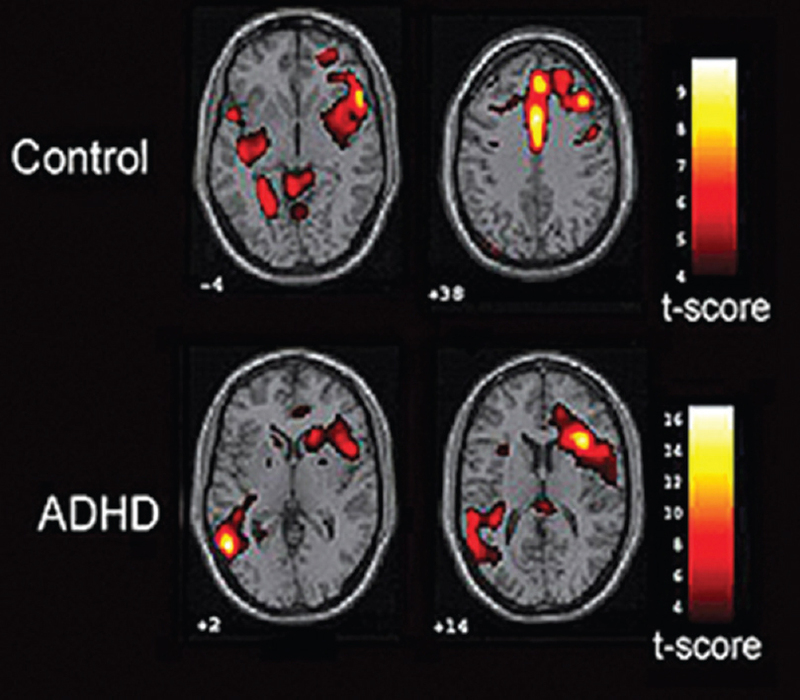 Meta-analysis of structural imaging findings in attention-deficit/hyperactivity disorder. Biol Psychiatry 2007;61:1361-9. Shaw P, Lerch J, Greenstein D, Sharp W, Clasen L, Evans A, et al. Longitudinal mapping of cortical thickness and clinical outcome in children and adolescents with attention-deficit/hyperactivity disorder. Arch Gen Psychiatry 2006;63:540-9. Silk TJ, Vance A, Rinehart N, Bradshaw JL, Cunnington R. White-matter abnormalities in attention deficit hyperactivity disorder: A diffusion tensor imaging study. Hum Brain Mapp 2009;30:2757-65. Casey BJ, Epstein JN, Buhle J, Liston C, Davidson MC, Tonev ST, et al. Frontostriatal connectivity and its role in cognitive control in parent-child dyads with ADHD. Am J Psychiatry 2007;164:1729-36. Durston S, Tottenham NT, Thomas KM, Davidson MC, Eigsti IM, Yang Y, et al. Differential patterns of striatal activation in young children with and without ADHD. Biol Psychiatry 2003;53:871-8. Valera EM, Faraone SV, Biederman J, Poldrack RA, Seidman LJ. Functional neuroanatomy of working memory in adults with attention-deficit/hyperactivity disorder. Biol Psychiatry 2005;57:439-47. Colla M, Ende G, Alm B, Deuschle M, Heuser I, Kronenberg G, et al. Cognitive MR spectroscopy of anterior cingulate cortex in ADHD: Elevated choline signal correlates with slowed hit reaction times. J Psychiatr Res 2008;42:587-95. Available from: http://www.ucdmc.ucdavis.edu/welcome/features/20071128_mind_adhd/. [Last accessed on 2017 Aug 07]. Carlsson ML. 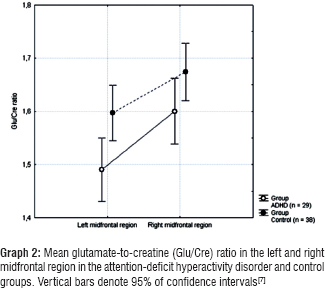 On the role of prefrontal cortex glutamate for the antithetical phenomenology of obsessive compulsive disorder and attention deficit hyperactivity disorder. Prog Neuropsychopharmacol Biol Psychiatry 2001;25:5-26.
van Wageningen H, Jørgensen HA, Specht K, Eichele T, Hugdahl K. The effects of the glutamate antagonist memantine on brain activation to an auditory perception task. Hum Brain Mapp 2009;30:3616-24. Bozkurt A, Zilles K, Schleicher A, Kamper L, Arigita ES, Uylings HB, et al. 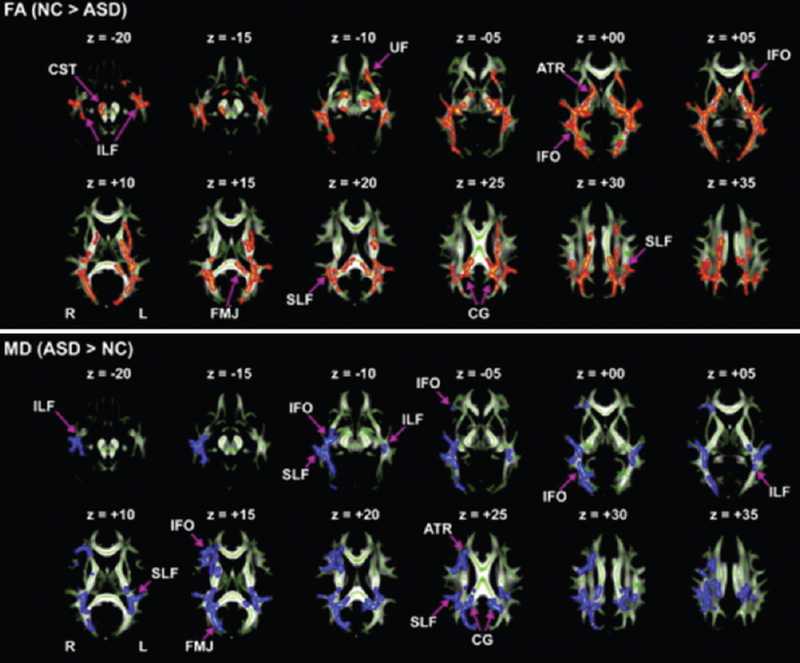 Distributions of transmitter receptors in the macaque cingulate cortex. Neuroimage 2005;25:219-29. Bush G, Luu P, Posner MI. Cognitive and emotional influences in anterior cingulate cortex. Trends Cogn Sci 2000;4:215-22.